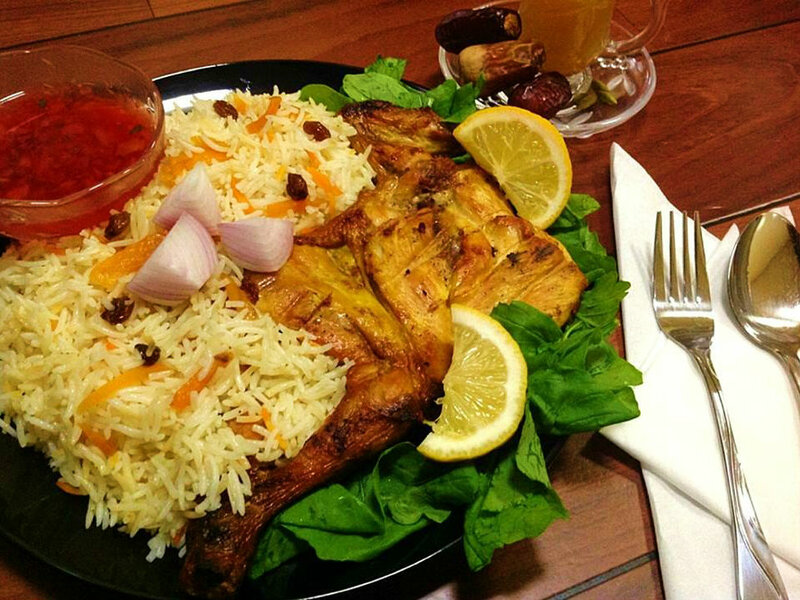 There are many kinds of Kabsa and each kind is unique. The spices used in Kabsa varies depending on who you ask, so try some different variations to find your own favourite mix. The dish is traditionally prepared with lamb, mutton or chicken, but is occasionally prepared with goat, camel, beef, fish or shrimp. The spices, rice and meat may be enriched by almonds, pine nuts, onions and sultanas. The dish can be served hot with daqqūs / daqous (Arabic: دقّوس‎) – homemade tomato sauce. Season chicken breasts with olive oil, salt and pepper and Kabsa spice mix. Cook the chicken on the grill or in the oven, turning occasionally until cooked through. Rinse the rice well and soak in cold water for 20 minutes. Drain. In a deep pan melt butter, add grated carrots and raisins, sauté. Add the remaining ingredients, bring to boil, reduce heat and simmer covered on low heat for 15-20 minutes until done. Mix all the ingredients in a medium pot. Simmer over low heat, while stirring, until well combined. Add more liquid if needed (water or chicken broth). Serve chicken with rice, daqqūs and a green salad. Salsabil was born and raised in Saudi Arabia. Salsabil’s great inspiration for cooking is her mother, who is a great cook. Her biggest passion is baking cakes and making desserts because she has quite a sweet tooth.